You're invited to the Goodnight Brew launch party! If you're in the Fort Collins, Colorado, area, pop in to our Goodnight Brew launch party tomorrow night (September 18th) at Equinox Brewing from 5 to 8 p.m. The author and illustrator will be there to sign copies. And Karla has promised to make chocolate stout cupcakes! You still have one day! 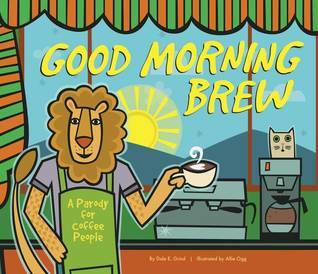 The Goodreads giveaway for Goodnight Brew ends in less than 48 hours. Drop your name in the hat today! Jackpot is a Jurassically juicy summer read! For those of you who preordered Jackpot, you've finally received it or, if you're not nearby, it's on its way to you. Cutie-pie Daniel just received his copy this afternoon. Meet Jessie McCoy, our new intern! Jessie McCoy is working on her M.S. in Publishing from Pace University. She holds a B.A. in English from James Madison University and loves all things books, movies, and TV. She spends her "free" time working at a local library and reading as many books as possible, including rereading her favorites when she can. She hails from the great state of Virginia but has loved the change of scenery in Colorado. If you've visited bailiwickpress.com before, you probably noticed that our site looks different. New and shiny. Thank goodness. It was time. Let us know if you have any trouble finding information or if something doesn't work!